The whare whakairo (carved meeting house) is seen as synonymous with Māori architecture. These beautiful houses are often named after – and seen as the personification of – ancestors. In the 2000s contemporary Māori architects continued to draw on Māori concepts and values in their work. The first known dwellings of the ancestors of Māori were based on houses in their Polynesian homelands. In New Zealand these buildings were semi-permanent, as people moved around looking for food sources. Houses had wooden frames covered in reeds or leaves, with mats on earth floors. To help people keep warm, houses were small, with low doors, earth insulation and a fire inside. Around the 15th century communities became bigger and more settled. People built wharepuni – sleeping houses with room for several families, and a front porch. Other buildings included pātaka (storehouses), sometimes decorated with carvings, and kāuta (cooking houses). Ngāti Porou ancestor Ruatepupuke is said to have established the tradition of whare whakairo (carved meeting houses) on the East Coast. Whare whakairo are often named after ancestors and considered to embody that person. The house is seen as an outstretched body, and can be addressed like a living being. The first whare whakairo were probably built in the mid-19th century. It was a time of great change for Māori, and larger houses let communities meet to discuss issues. 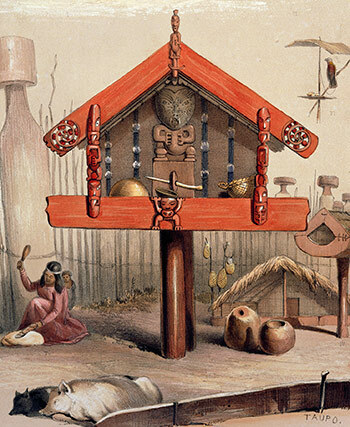 Designers combined the carved decorations of pātaka with the porches of wharepuni, and increased the size of houses. European materials were also used. Houses built for the prophet Te Kooti were decorated with paint rather than carvings. At Parihaka in Taranaki, thatched whare were replaced by European-style houses. Prophet Rua Kēnana based his Hīona courthouse in the Urewera on biblical descriptions of Solomon’s temple. By the 1920s the traditional arts of building whare whakairo were in decline. MP Āpirana Ngata worked to revive these. A school of Māori arts and crafts was set up in 1927 and constructed houses for communities. Women were not allowed on building sites due to tapu, but got involved making tukutuku (decorative woven panels). The carving school closed in 1938. It had produced many carvers and craftspeople, who went on to teach others. From the 1960s marae complexes were built in urban areas. They included buildings such as wharepaku (toilets) and whare ora (health centres). Meeting houses were still one large space with a porch and one door and window in front. In the 1980s marae began to be built in prisons, schools and universities. John Scott and Wiremu Royal were among the first Māori architects and architectural designers working outside traditional architecture. Scott designed Futuna Chapel in Karori, Wellington. Others include Rau Hoskins and Rewi Thompson. Their buildings draw on Māori concepts and values.